When it comes to ACA reporting, you’ll want to make sure you have all of your bases covered. That’s why WORKTERRA put this guide together for you. 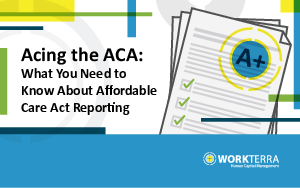 We’ve boiled some of the most important aspects of ACA reporting down to the essentials so that you are better equipped to comply. And, if you need a little help, WORKTERRA is always there for you.